The high cost of electricity on Martha’s Vineyard can be a burden or an opportunity, depending on how you look at it. Rates now stand at about 21 cents per kilowatt-hour, and they fluctuate over the short term, but over the past two decades they’ve increased by an average of 6 percent, per year. Paying some of the highest rates in the nation, NSTAR customers on Martha’s Vineyard see big bites taken out of their pocketbooks for electricity every month. But if you look at that money as capital, here’s the opportunity: You can shift that capital, so that rather than paying NSTAR, you’re paying for the solar photovoltaic (PV) system on your own roof. The Cape Wind project has been in front of permitting agencies for so long that its core technology has changed: Each turbine in the wind farm will generate three times more electricity than the models Cape Wind originally proposed to use in 2001. Meanwhile, over the same span of years, the changes in the solar power equation — both in the hardware and on the regulatory front — have been even more dramatic. The Green Communities Act, enacted by Massachusetts in 2008, was a game-changer. It required that utilities and power plants in the commonwealth make renewable energy a part of their mix, and it set up a market system called the Solar Credit Clearing House Auction so power companies can bid for the right to count the electricity generated by home solar systems toward their mandated goal. When the utilities buy your solar energy credits, you get a payment every year. The Green Communities Act also provides for net metering — allowing homeowners to hook their solar systems to the power grid and actually run the meter backward when the sun is shining. If you own a solar PV system in Massachusetts, your utility company becomes a sort of giant battery: The meter runs in reverse whenever your system is making more power than your home needs, and you collect credits that are worth within a penny or two of your retail electricity rate. At night, when your home has no solar power, the meter draws down the credits your system accumulated during the day. 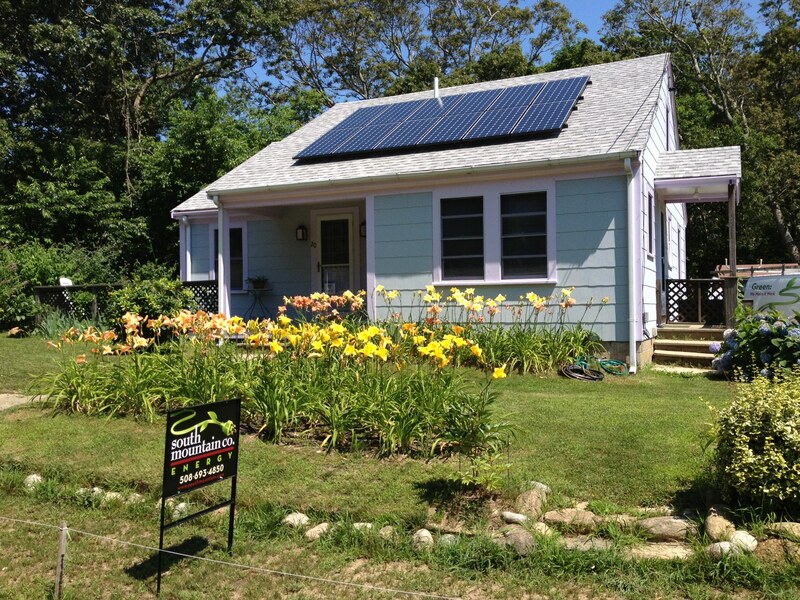 Then there’s the matter of government rebates and tax credits: Massachusetts and the feds are both generous with incentives for solar home systems, currently covering about a third of a typical installation’s cost. That covers the regulatory good news. There has also been great progress on the technological front. Expressed in terms of dollars per kilowatt, the cost of solar PV panels has fallen by two thirds in the past five years. 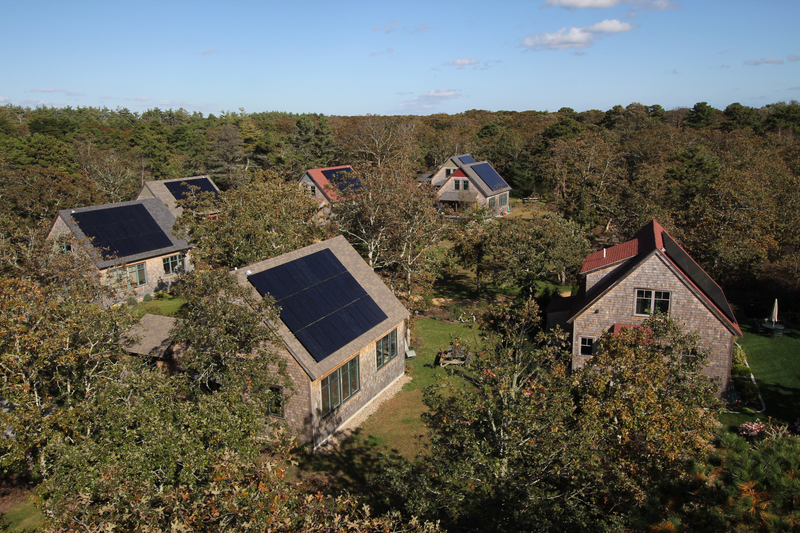 Just in the two years between 2008, when SMCo put photovoltaics on roofs at the Jenney Way affordable housing project in Edgartown, and 2010, when the company installed a larger system at the Eliakim’s Way housing in West Tisbury, the installation cost per kilowatt fell by about 40 percent. What this means for an Island homeowner with a suitable site is that the investment in solar no longer takes 10 years or 20 to pay for itself. Many solar systems can be cash-positive in the very first year. Given the chance to sit down with a homeowner and talk through the workings and finances of a solar PV system, Rob Meyers said he can usually make that homeowner a customer. South Mountain put just three solar systems on Island roofs back in 2005, the first year it offered this service; now Meyers’s department is by far the Island’s largest provider of home solar systems, installing them at the rate of about one per week. The take-away here is that you don’t need to be an early adopter or a passionate friend of the environment to consider solar power for your Island home. This is mature technology, and the costs have plummeted. The same SunPower panels being installed across the Island right now are also making electricity for such bastions of industry as Hewlett-Packard, PG&E, FedEx, Del Monte, and Microsoft. To state the case even more succinctly: If you own a home and pay an electric bill, you could probably profit from solar power right now.